S.T.Dupont draws inspiration from the Taj Mahal, masterpiece of architecture, to create a Limited Edition of exceptional objects using the most noble and precious materials, platinum and mother-of-pearl, joined together by S.T. Dupont's skilful craftsmen. 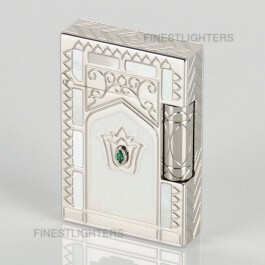 The lighter is finished in platinum and white Chinese lacquer, with mother-of-pearl and Alpinite stone inlay. Only 2000 individually numbered pieces of this lighter were made in 2002.